Best Value in Kits! 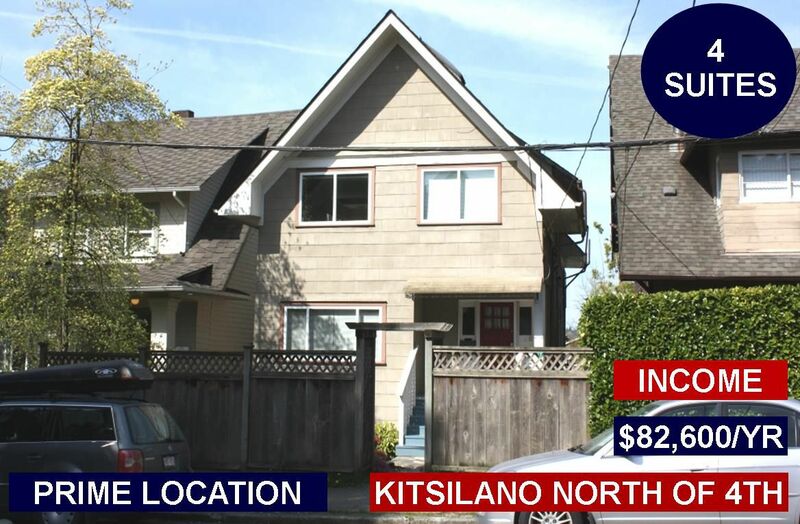 Fabulous 3687 SF "North of 4th" Updated 4 Level Cash Machine, 4% Cap Rate. Gr Income $90,792/yr; Net $75,830/yr w upside from great tenants! Top: 2 level, 1610 SF 3 Bdrm, 1.5 Bath Suite; Main: 1000 SF, 3 Bdrm Suite; Down: 2 X self contained 1 Bdrm Garden Suites (approx 450 SF each). House in good condition, many updates incl. sprinklers, electrical, plumbing, full insulation. Great “do nothing” investment w potential to increase revenue or return to SF residence w mtg help. Future potential for assembly/rezoning/redevelopment. Quiet street, 1/2 blk to shopping, transit, 4 blks to Beach, minutes to UBC, Downtown. Perfect for Investors, Owner Occupiers, Shared Ownership. Call LS for info pkg, floor plan. Showing by Appointment Only with 2 days notice. Showing Saturday Feb 16th @ 1:00pm gone by 1:45pm by Appointment Only. Call Bob Bracken @ 604-220-2035 for Details, & to Discuss Real Estate.